Lara Espirito Santo, aged 27 from Rio de Janeiro on her experience at Le Cordon Bleu London, and how she went from a Degree in Politics and History and a Masters in Poverty and Sustainable Development to studying the Grand Diplôme®. 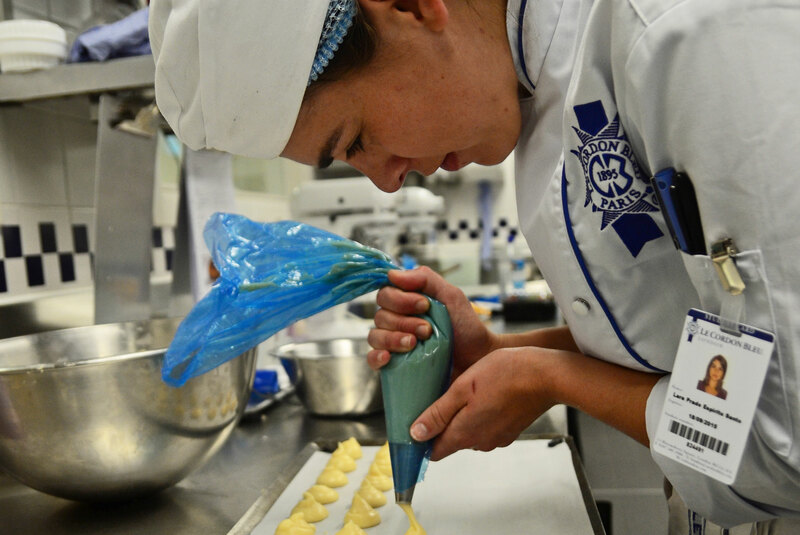 What made you choose Le Cordon Bleu London? There were two main reasons. The first because I love London and it was the perfect excuse to come back to the city that felt like home, and secondly because everyone that I had spoken to had advised me to train in London as it has the best chefs and great infrastructure. What stage of the Grand Diplôme®. are you at now? I am currently in week two of superior level and I can already feel the difference from basic and intermediate and I'm being a lot more explorative with ingredient combinations and flavour profiles. We are getting to grips with working with what we have and trying to be as creative as possible with the way we cook our ingredients. I can certainly feel our chefs preparing us for the industry now, for example if you didn’t have a delivery one day, what would you do? We are being faced with real world situations which is invaluable experience. What is your favourite part of the course? I love the course, absolutely everything about it! For me the most interesting part has been experiencing both cuisine and patisserie. Cuisine is about palate development, achieving technique and depth of flavour. It’s intuitive, while patisserie is extremely technical. But understanding the chemical process is absolutely essential, and it’s fascinating how much your skills and knowledge overlap across both disciplines. What’s been the most challenging part of the whole course? There really is a combination of challenges; one is learning to work beyond your limits, both physically and mentally. But I have also been battling my own personal challenge. Before joining the school I never considered myself as creative, I have been analytical all my life and it was hard to break down my personal barrier. I remember being faced with my first fruit tart and I thought to myself what do I do with all this fruit!? But I have overcome this and now I can produce things that are elegant, well finished and not haphazard. I think for me it helps to plan each lesson and sketch out my design to stop my creative blocks. Do you have a favourite kitchen gadget? My chef’s knife! To be honest it’s become a part of my arm. Do you have a favourite ingredient? That is an unfair question for any chef! But if I had to pick something I think it would have to be game! I’m also obsessed with rosemary and thyme, my favourite herbs! What do you do to relax and unwind? I don’t! But on a Saturday, if I have nothing to do I’ll bake a cake or try a new recipe. I also love to cycle, not that I have much time for it anymore, but I’ve always been a big outdoors girl. I grew up on a farm and I love taking my dogs for nice long walks. What are your plans when you leave Le Cordon Bleu? I’m planning on taking up the Diploma in Culinary Management when I finish the Grand Diplôme®. I love the programme and I have also taken a year out to study, so it seems silly to miss out on something that may give me a chance for more opportunities later on. I’ve worked with NGO’s and in government, which eventually led me to having my own consultancy. I used to help people create more of a sustainable and social impact in their business models and then I realised that I’ve spent so long telling people how to make a business, and not applying these principles to something of my own. Food has always been my biggest hobby and I would love to apply what I know now to a restaurant that is sustainable, uses organic produce and provides apprentice schemes for people from vulnerable groups. Food is social from beginning to end, from when it’s grown, to the way it’s eaten, right through to the way it’s disposed of or passed on through charities. What has been the most constructive piece of criticism you’ve ever received? It has to be something that Chef Anthony at this school said to me, according to my mum it has saved me 10 years of therapy! He said that when I go into the kitchen with an expectation of how something is going to turn out and when I don’t achieve that, I feel completely disappointed and start to doubt myself, and that reflects on my work. He told me that I must never let that feeling disappear, but rather than losing my confidence, I have to push myself on, understand what I’ve done wrong and next time come in and do it better. Since he said this to me it has changed me whole attitude in the kitchen. How do you stay engaged and passionate about your work and not fizzle out? Training at Le Cordon Bleu is the first step for me in a long career plan. Every step I make is a step closer to achieving my final goal. I’ve seen how much people progress from intermediate to superior and it makes me excited to make that transition myself. What is the best part of campus life here in London? My friends! You can’t attend a school and study some quite unforgiving hours and not make friends. Some of the people I have met here will be my friends for life. You see each other at such highs and at such lows that you become close very quickly. What is a typical week like for you? Well usually I get up at 5:45 and make my way into school for demonstrations and practical classes. Most days my classes will go on until 6 or 9 pm, so after that I will walk my dog and get ready to start the day all over again.